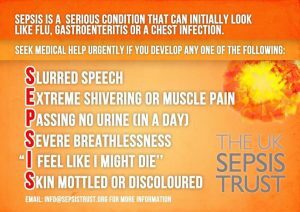 Sepsis is the body’s overwhelming and life-threatening response to infection. It can cause tissue damage, organ failure and sometimes death. In medical terms, sepsis is defined as either ‘the presence of pathogenic organisms or their toxins in the blood and tissues’ or ‘the poisoned condition resulting from the presence of pathogens or their toxins’ as in Septicaemia. Sepsis is caused by an infection, usually associated with an illness (like diabetes or cancer), it can however also be caused by an infection following a routine surgery or procedure, or in response to incidents as seemingly as benign as a playground scrape. If you have a child with symptoms including abnormalities of body temperature, heart rate, or respiratory rate, don’t delay. Seek medical attention immediately. This really is a case where every minute counts.